Lou Rudd joined the UK armed forces at the age of 16, where he has served a full career, spanning nearly 25 years. 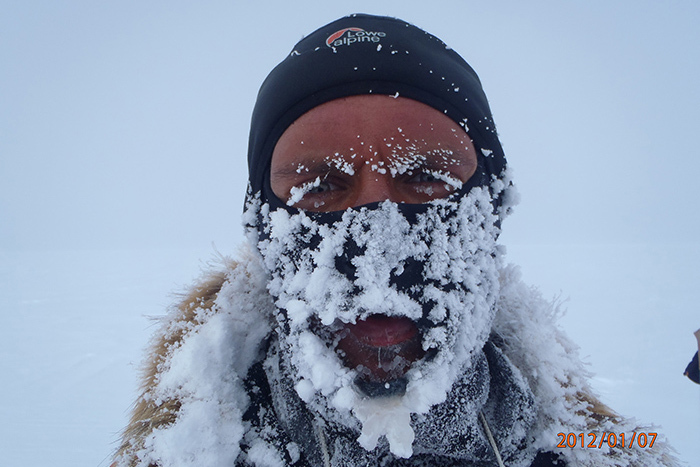 During his military career Lou completed many tours in extreme cold weather environments, some inside the Arctic Circle. He is a qualified military ski instructor and an Arctic Warfare instructor. 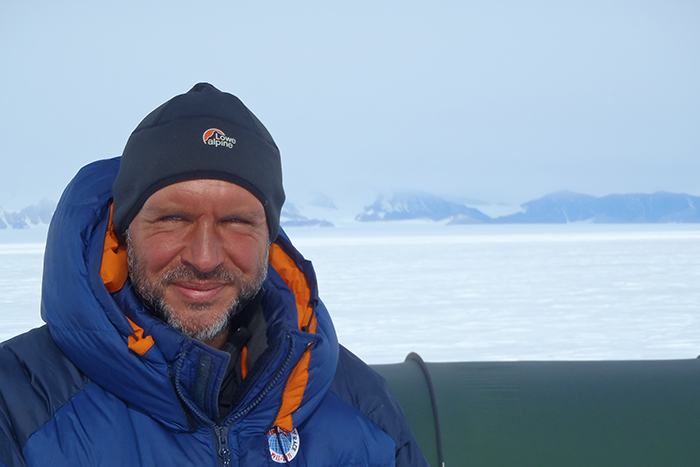 During the winter of 2011 and 2012 Lou, along with Henry Worsley, completed an 800-mile unsupported journey following the original route of Roald Amundsen from the Bay of Whales to the Geographic South Pole as part of the Scott Amundsen Centenary Race. 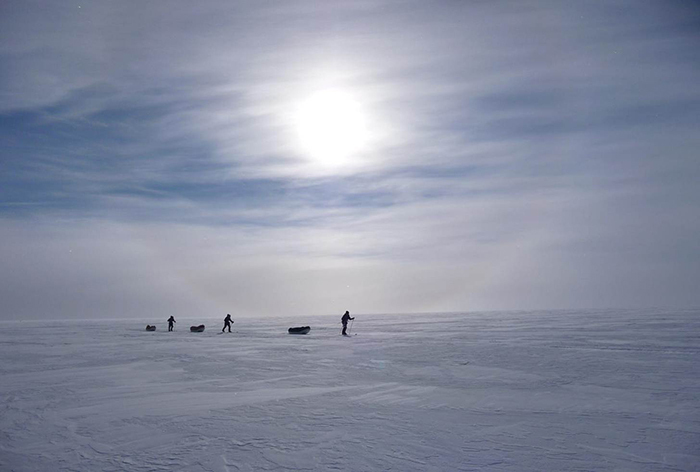 Travelling unsupported to the South Pole means hauling everything required for the 800-mile journey, including enough food and fuel for 70 days. Photo courtesy of Lou Rudd. Man and pulk. 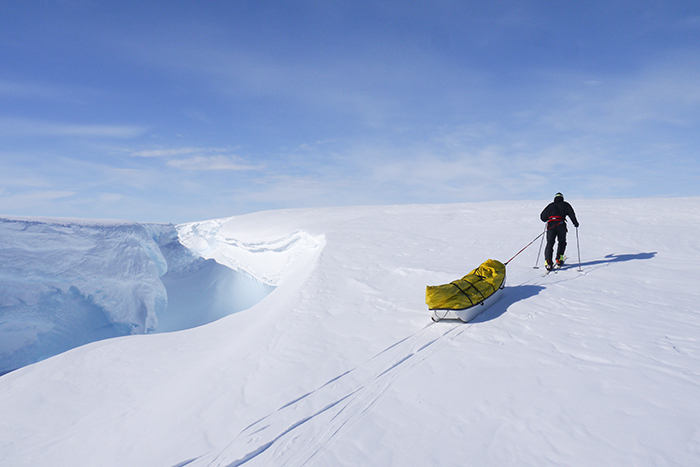 Hauling all the food, fuel and equipment to the pole burned up around 10,000 calories per day. Photo courtesy of Lou Rudd. Loved this podcast! Great job Paul! physical endurance mandate the subject! PS I still hear the whistles of high alpine marmots echoing across the glaciated peaks. Thank you again for an entertaining and informative podcast. 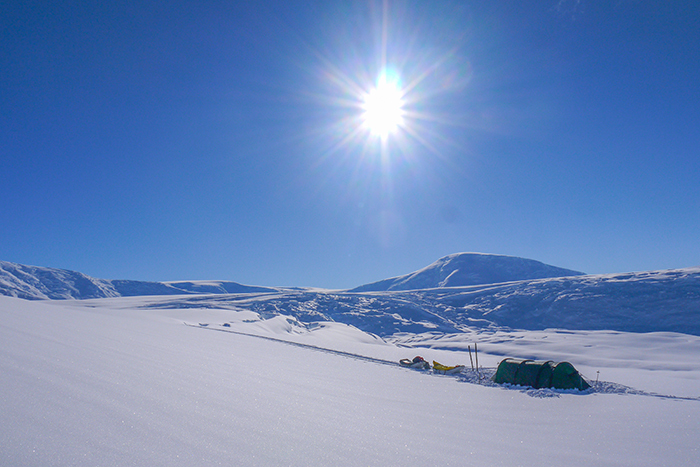 It is a testament to Lou Rudd and his team that they were able to follow Amundsen’s route to the exactitude of being able to find Mount Betty and that tin of paraffin and dog food left there over a hundred years ago. It is also a testament to Roald Amundsen’s safety margins and leave no trace practice it being the only thing he left behind. Off the bat I must recommend a book, it is my favourite book: ‘Scott and Amundsen: The Race to the South Pole’ by Roland Huntford first printed in 1979. This is a history book but it is also about leadership and personality. I was prompted to read this book after watching ‘Shackleton’ starring Kenneth Brannagh. It is extremely readable (at least once you get past the early years stuff of both Amundsen and Scott). It is well researched and full of quotes from original sources. I find it completely convincing because of its level of detail. It is in the form of a ‘compare and contrast’ between Scott and Amundsen. Let’s face it, any explorer would come off worse in a comparison with Amundsen. Not only his safety margins but his planning in general, his style of leadership, his recruitment, his attention to detail, his respect for local knowledge, his sense of mission, his hardiness, his sensitivity, in all of these Amundsen was way out in front … But I am getting carried away. Correction: the Fram was not the boat that took Amundsen through the North West Passage, that was Gjoa although Gjoa is also on display at the Fram museum in Oslo. The Fram was originally Nansen’s boat the one that was designed to be ice-bound that Nansen used in his polar drift to the North Pole. Amundsen and his men used dogs, sledges and skis from the outset. Scott started off with tractor, skis, dogs, ponies and man-hauling and ended up man-hauling without skis. Amundsen’s daily calory intake was 4560. Scott’s was 4430. Amundsen needed 4500 for the work he was doing. Scott needed 5500. Amundsen’s basic sledging ration per man was 400gm biscuits, 75gm dried milk, 125gm chocolate, 375gm pemmican, a total of 975gm. 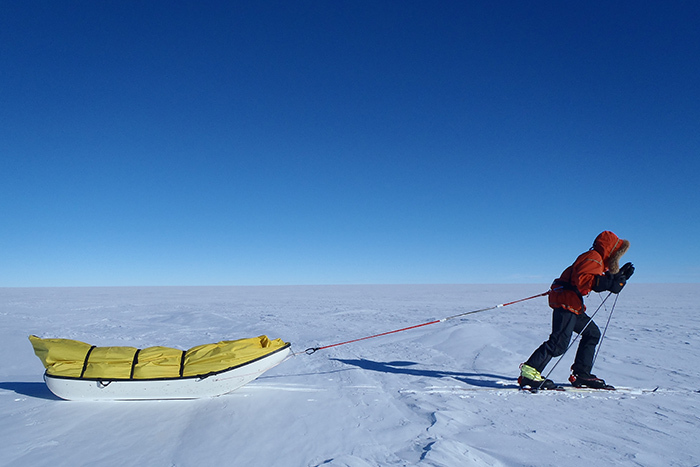 Amundsen attended to every little detail concerning equipment constantly adapting it and refining it in the light of experience including the sledge runners. Bjaaland one of Amundsen’s men produced a box of cigars when they reached the pole. He himself didn’t smoke but he had brought it all the way with him as part of his personal weight allowance for his compatriots to celebrate. Morale! Morale! Morale! Amundsen’s diary entries were in the form of a ship captain’s log, short and factual describing the going, the weather, notable events, etc.. He didn’t write with an audience back home in mind. Radio had just been invented but Amundsen decided not to take a radio set. 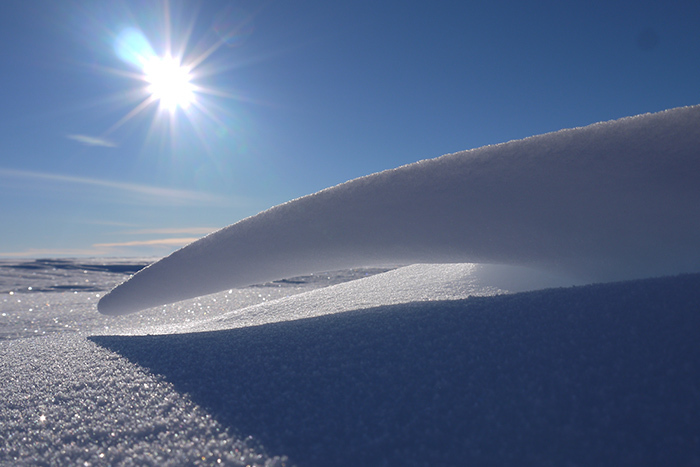 Their expedition lasted years as it set off from Norway first and over-wintered on the Barrier. Amundsen reasoned that a message from home saying a family member was ill could have a morale-lowering effect. I could say a whole lot more about Roland Huntford’s book but I shouldn’t. Sorry to have gone on about it. Thank you again for a fascinating and stimulating podcast. I always get something out of them despite my limited experience, there’s always something, some nugget that inspires me. That was amazing! Really enjoyed it. The best podcast so far. Thanks for sharing! Brilliant podcast and photos Paul and Lou. Have listened to this a couple of times now. Gives great insight into what is needed, what is done, and how. Humbling. Look forward to the follow up (before and after trip). Safe trip Lou and crew. Yet another superb conversation Paul. Each episode is surprisingly unique and across such a range of subjects and contexts, from the practical to the academic. I may just be missing it but wondered if it’s worth attaching a date stamp to each podcast in the future? Might just help put them in context for anyone listening to them someway down the line. If this info’s already here and I’m just being unobservant apologies. Hi Dan, thanks for your comments and feedback. Good point re timestamps. The year is in the URL but not the month. Something for me to think about….